There have been a lot of requests for more information on the container / shipping process. Since this is an ongoing process for us, and since the process like so many other things here in Chile is always changing, I thought it was best to make several posts. 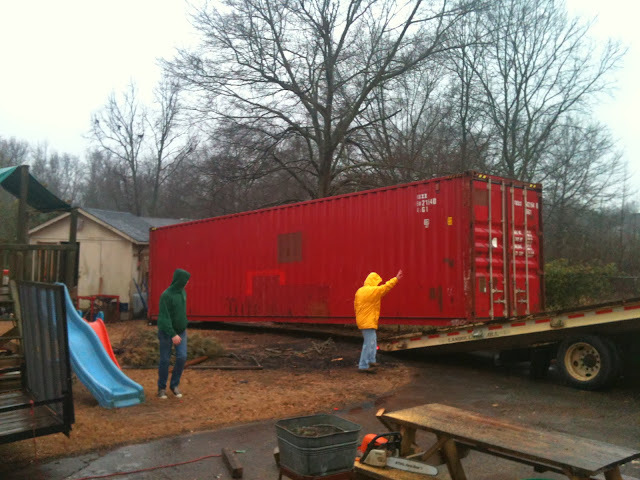 So, for those of you who are getting your move in order, you will want to book mark this first post on shipping containers. "..... there are 300 years of love and dreaming in my things and.... I need them.... I want them and I'll have them" . STUFF! As a family, for us every day we have been here one of us will say I just wish I had my "what ever" from the container. I would be so much happier if I just had that one thing and I could get this done or be able to move on to another task. It comes to the fact that we are comfortable with what makes us comfortable and in many cases that is what gives us a feeling of permanence and home. The feeling of having your things about you is very comforting and it helps to make your new house a home. I think it is important to be as comfortable as you can in your new country, so I say ship it all as much as you can and then some. It will make your life easier and your transition less painful and stressful. 1. It is almost as cheap to ship a 40 foot container as it is a 20 foot container. +/-$1,000 difference in pricing, and when you are talking about your stuff and a once in a life time event $1,000 might as well be $1.00 so get a 40 foot HIGH BOY container which is 40 foot long by 9 foot tall. They sell 8 foot tall containers and you do NOT want one of these as that extra foot in height is cheap and it lets you bring taller house hold items with no problem. It is well worth the extra $300 to $500 for the TALL BOY at 9 foot. 2. Renting a container is more expensive than buying a container. There is one exception and that is if you are moving to the city and you do not want to have an empty container hanging around after you have emptied out all your stuff. We have friends who have rented, and they paid more for the rental and storage then they would have for the purchase of the container out right. 3. Where to buy and particulars: In the upstate of South Carolina I went to L&L container on White Horse Road at I-85. Ask for "Van" the owner. He will try to "UP SELL" you so barter hard. You are not a shipper so just buy a container that will make one more trip. It will need the "Inter-modal Stamp" and the updated inspection on the door. DO NOT LOSE THE PAPER WORK THAT HE GIVES YOU OR YOU WILL NOT BE ABLE TO SHIP YOUR CONTAINER!! If you are not in the Greenville, SC area then look up on the internet shipping containers and you will find lots of choices. You will want one that is close to where you live so that your delivery expense is not as high because they charge a per hour (there and back) for delivery. 4. How much did JIM and LORI pay? $4,300 for a 40 foot X 9 foot tall sea worthy container. It was beat up but was still sea worthy and had to pass the inspection which was placed on the door. The boys and I bought some oil based paint and now it looks like new. Van offered to paint the container for $500, and we chose to save the $$$. Remember it only needs to make one more trip. So a few spots where holes were welded is no big deal. The price we got was tax, title, and delivered with Inter-modal paperwork and sea worthy stamp on the door. Van does the inspection and will give you the paper work when the container is delivered. 5. What to look for when buying? Good doors and seals. The doors should close tightly and easily. There should be minimal rust around the doors. The roof should be solid and with out any holes. It must be water tight. I climbed on top of the container to see how bad the rust was on the top. You can not see the top from the ground. Van did not expect me to do this but was accommodating, and he had a ladder available. You can bet your shoes that Van looks at the roof of a container before he buys them, so shouldn't you? The roof is the easiest spot to get ripped off. If you are too scared to climb a 9 foot ladder, give Van your cell phone and ask him to climb up and get a picture for you. He will do it if he wants to sell the container and......... HE DOES WANT TO SELL ONE! On the inside look for solid flooring. Containers are wood floored, which is good because then you can screw straps and such into the flooring to tie down furniture. So the floor should not have ANY, ANY rot at all. The walls should have welded loops at the tops and bottoms at the ceiling and floor which need to be in good order so that you can use straps and chains and such to tie down your stuff. Remember your stuff will be slogging around at sea for 3 to 4 weeks and likely in rough seas so strap it down and stack it high all the way to the roof so it will not move. 6. To drop or not to drop? 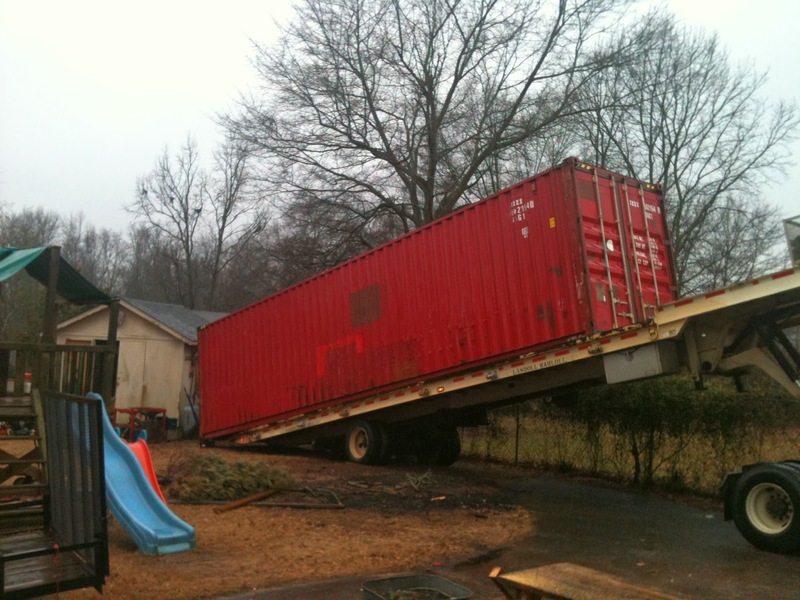 You can have your container dropped in your yard or it can be delivered on a chassis, basically on the ground or on wheels. Of course you will have to pay for the wheels (you knew that was coming I can tell). We decided to have it dropped in the yard and had them set it on some WOOD BLOCKS(not concrete, do not use concrete they break over time). Van can deliver your container on a chassis and rent the chassis to you for around $75/month (this price may have gone up I do not know). We wanted a good long while to load our container before and after we left the USA, so we opted for the dropped in the yard option. We could have bought a chassis for $3,000, and then we would have had to sell it when the container is loaded at the port in Charleston, SC. For us it was smarter money to pay $1,050 to have the container picked up by a LAND DOLL tractor trailer and hauled to the port. No chemicals, no gas or diesel engine operated equipment (anything with an engine is not allowed), No tires (I think they mean new or used on the rim), NO VEHICLES without it costing you a tax of 60% of the vehicle, no raw wood, no food or vegetables, no grains or rice, NO NEW ITEMS! 8. THE LIST: Here is some more work for you..... because you do not have enough already! As you load your items in your boxes you need to make a list of what is inside them. This is for you and for the Aduanas or Customs here in Chile. They will need a complete list of everything in your container. This list will have to be translated before you give it to them and anyone can translate it down here for you once your list is complete. ALL ITEMS ON THE LIST MUST BE MARKED USED OR IN SPANISH USEDO! They do not want you to bring in NEW anything! They think that you will sell it. One of our friends had a computer that he brought in the original box and they made him prove it was used. Do not sweat this as you will want to know as well what is in each box, and with just a little more work you will be able to give the customs people here in Chile a list of what is in your container. Lori and I used an excel spread sheet to make our list and every box or item has a corresponding number on the outside. You can be as detailed or as vague as you like, and there are obvious advantages to each approach which I will let you use your imagination to figure out. Some people even make two lists. I would mess this one up and give the wrong list to the right people at the wrong time. So I am very vague as to what is in some boxes. Some of these vague boxes are at the vvvveeeerrrryyy front of the container and are very difficult to get to, if you know what I mean. You do not want to bring your appliances. The electricity is 220/50 htz here and 110/60 in the USA. Yes, you can bring converters and the like and you can easily buy converters here but it is not worth it because they wear out quickly on the converters. So just do not bring them. DO BRING: All Furniture, Equipment; anything that is 220/60 and you can almost be assured that it will work fine here in Chile. Radial Saws, Drill presses, Planers, Joiners, welders, air compressors. Anything with a 220 ELECTRICAL motor is good to bring and you will not need a converter. Our Mennonite friend has been running 220/60 htz equipment on Chileano 220/50 htz power now for the past two years with no problems at all, NONE! As a side note if you use these things they are about 3 times cheaper in the USA. So if you need or want them, buy them, use them and put them in the container and save big $$$$$. Also do not be afraid to bring consumables for your equipment like welding rods or saw blades or nails for your nail gun which are hard to buy here and costly. Just mark them used and put them in one of the vague boxes we talked about above. 9. BUT JIM HOW DO YOU KNOW ALL THIS IS RIGHT? 3. ¿Qué mercancías no puedo importar? Mercancías que sean peligrosas para los animales, para la agricultura o la salud humana (por ejemplo; algunos plaguicidas de uso agrícola, juguetes y artículos de uso infantil que contengan tolueno, adhesivos fabricados en base a solventes volátiles), las que se encuentran prohibidas por Decreto del Ministerio de Salud, del Ministerio de Agricultura y otros organismos del Estado. Otras mercancías, que de acuerdo a la legislación vigente, se encuentren con prohibición de importar. 10. How do you know what you need? Easy! As long as you are in the USA you do not know what you need. I can not tell you everything that is not or IS here as it would take all day. Rest assured they have everything you need, maybe not in the brand you like or accustomed, but they do have it and it is likely at a higher price. 11. When to ship? What I suggest is do not ship your container until after you have been here for 90 days. You will also find out what you need, want and would like to have added to your container before it is shipped during this time period. Now before that 90 day Tourist Visa is up (if you like it here) you will apply for a "Temporary Residency Visa". It is during the temporary visa period that you can ship in your $$$$$ DUTY FREE $$$$$$ container for your family (one container per a family is allowed or per an individual if not a family). It really does not make sense if you think about it; what if after your temporary residency they do not let you stay and you already have your container here? Oh well! At least you got it in Duty FREE$$$. We have a friend who is a permanent resident and she is shipping a container and will have to pay significant taxes at 19%. So SAVE, Save, save $$$, ship duty free. We are almost ready to ship our container to Chile. I have about 5 quotes ranging from $3,750.00 for shipping only (no associated fees) all the way up to $9,995.00 for door to door service (these people are loony tunes). $1,000.00 to get it from Spartanburg to Charleston and delivered in the port ready to load on ship. $250.00 for Aduana fees / shipping agent who gets it through the port and customs. This is necessary. **$1,500.00 to get it to the South of Chile near Osorno, about 10 hours trucking time south. **The unknown is the Trucking fees from Conception to where we live as I do not yet have that quote. Also we looked for a shipper that went into Puerto Montt Chile but could not find any. Puerto Montt is much closer to us, only 45 min drive. So we are working on getting quotes to Puerto Montt to save us the Chilean trucking fees by over half. But we will see. I will post again as we move forward on ordering it as the process continues. This all can be come very complicated and to get a straight answer would be very helpful to all of you so that you know what to expect. As a side note, my Mennonite friends have shipped a small 4' X 4' crate of goods and it cost them around $2,800, and that was before the taxes were paid or the port costs or any of those sundries. The lesson here is to bring down a full container. ps -- that info about the 4X4 container is really hard to swallow. Yikes!